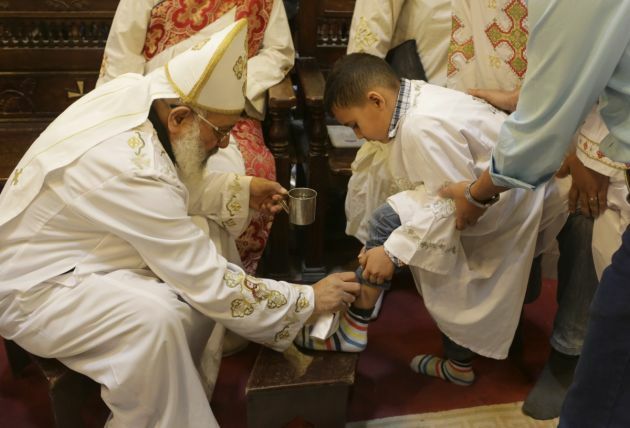 (Photo: REUTERS / Asmaa Waguih)A Coptic Christian clergyman conducts a feet washing ceremony on Holy Thursday at a church in central Cairo April 17, 2014. More than two years after Coptic Christians in Egypt faced a wave of attacks from Islamist extremists during the one year tenure of President Mohamed Morsi, his ousters are pledging to carry out promises to repair damaged property. Coptic Christians in Egypt faced waves of attacks in the north of the country in August 2013 after pro-Morsi sit-ins were broken up. Egypt President Abdel-Fattah El-Sisi apologized for not finishing the reconstruction work of Christian properties damaged following Morsi's ouster in 2013, the Assyrian International News Agency reported Feb. 7. While visiting Cairo's St. Mark Cathedral on the Coptic Christmas Eve in January, El-Sisi apologized to the country's Christians over the delay in the completion of renovations, which he says will be done by the end of 2016. El-Sisi was hailed by many Christians as a savior when he seized power in 2013 after the repression they suffered under the Muslim Brotherhood-backed rule of Morsi. But he has faced criticism for autocratic rule, extravagant spending and failing to carry out many of his promised reforms. He said, "Unfortunately, we only received 9 million Egyptian pounds and $8,000 since the initiative started, which is a very small amount of money in relation to the damages." Restoration work sponsored by the Armed Forces will cost some 200 million Egyptian pounds ($25.5 million). "I appreciate so much the president's promise to continue the restoration process this year," said Bishop Macarius of Minya in a phone call with Ahram Online. He also thanked "the Armed Forces for their effort in renovating the churches to return them to the way they were before the attacks, or even better." At the same time he thanked, "the efforts of the Muslims who protected churches from attacks and provided refuge for their Christian neighbours to save their lives." He noted that Aug. 14, 2013 marked the worst attacks in the church's modern history, "as all Christian lives were threatened." "They lost their properties in seconds, but thank God despite all the sectarian incidents and discrimination, Christianity in Egypt not only remains, but flourishes." Although Christians only make up roughly 10 percent of the Egypt's 90 million people, many Islamists blamed Copts for the massive, nationwide protests that preceded Morsi's ouster on July 3, 2013. The attacks following the dispersal of two pro-Morsi sit-ins targeted churches and Christian religious institutions, as well as Coptic-owned properties including six Christian schools, 60 houses, 85 shops, three hotels and 80 vehicles. A number of Christians were also killed in the attacks. The churches being renovated were attacked in August 2013 on the day of the dispersals of pro-Morsi sit-ins in Cairo, and were followed by sectarian attacks against Christians in Upper Egypt, where the Coptic population is relatively large. El-Sisi was defence minister at the time and had announced that the Armed Forces would pay the costs of renovating and rebuilding all churches damaged in the attacks, which lasted over 12 hours. The Coptic rights group Maspero Youth Union (MYU) said supporters of the Muslim Brotherhood, the group to which Morsi belongs, destroyed and set fire to around 65 Churches. Some these churches, according to the report, dated as far back as the fourth century.